Work life has become quite strenuous, which is why many people carry their work home. Then there are others who work from home. In order to work from home, what you need is a peaceful corner to concentrate on your work properly. This is possible only if you have a special area designated as your workspace. However, a home office need not be dreary and boring. You can actually do it up in a classy manner to give it a welcoming look, which in turn can work wonders for you. But this is easier said than done. If you do not have a proper plan while setting up a home office, you may end up with a cluttered work area. Looking for some elegant and functional home office designs? Take a look at these to get some inspiration. Need more space on your work desk or want to have enough workspace for two people? Well, it would be a good idea to use an L-shaped table in wood. Add in a couple of drawers at one end of the table for storing essential stationery. Move the desk to a corner of the room such that it fits into the wall. Add in a classic looking table lamp in the middle. Place a swivel chair with wheels that would make it easy for you to maneuver yourself across the table. Add a personal touch by putting in some family photographs. Use vertical blinds for the window. If you want your home office to look lively and vibrant, it would be a great idea to do it up in some bright colors. Color one wall a bright yellow and the others in cream. Cover the wooden floor with a bright yellow rug with motifs. For the work table, go for an elegantly cut one legged glass table. Pair this up with a modern white chair. Use plexiglass chairs for the seating areas. Add in a white leather couch and a center table in beige to complete the look. You can even add in an elegant bookshelf to give the whole office an aesthetic appeal. In case, you have a fireplace in the area which you intend to convert it into a home office, use wooden furniture to give the place a classy look. Paint the fireplace in white and place your rosewood work desk opposite to it. Go for a modern looking chair to complement the desk. Put in two filing cabinets made of rosewood on either side of the table. Add a cozy touch by placing a feathery rug under the work table. Use vertical blinds for the windows and put modern style light fixtures with beige lamp shades. Want to have a rather uncluttered look for your home office? Well, go for a modern design. Use gray tiles for the floor and put in a gray brick wall interspersed with white painted walls. Place an all glass work table in the center of the room. Pick a modern work chair in wood and fabric with an elegant design. 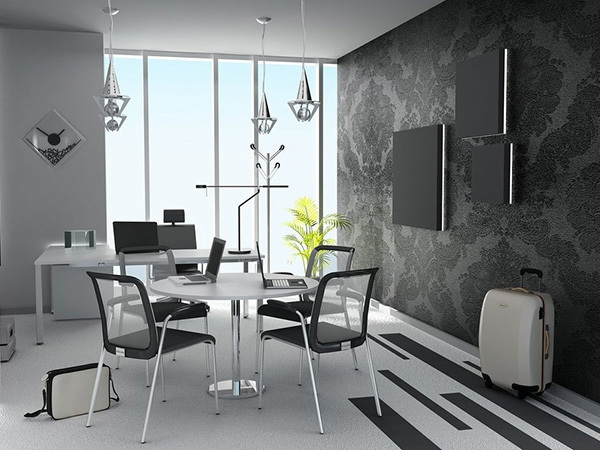 Use tall floor lights to light up your office space. Leave the windows bare to let the light stream in that would give the room a cheery look. Use the window sill as a book shelf. 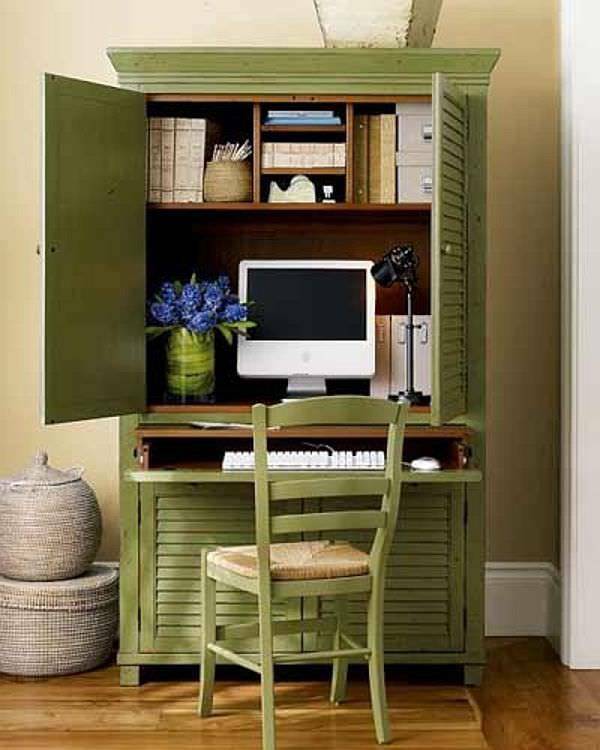 Don’t have enough space in the house for a full-fledged home office? Go ahead and convert a wooden cabinet into a workspace. Paint it with a muted green color. Remove one or two shelves to make a place for your computer. Let the upper shelves double up as bookshelves. Cover up the lower portion of the cabinet to create a filing cabinet of sorts. Pull in a wooden chair and paint it the same shade as the cabinet to complete the look. You can give your home office a modern look. 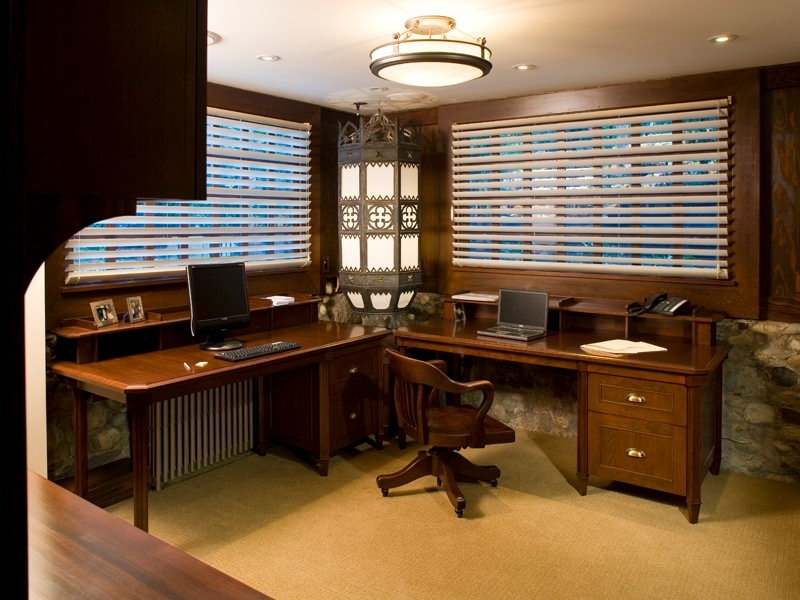 Both colorful designs, as well as monochromatic patterns, look good when it comes to home office design. However, do not forget to add in some storage space for storing important documents and other stationery items. In case you have other functional home office design ideas, do share these with us.